1. Bring potatoes and salted water to cover to a boil in a large saucepan; reduce heat, and simmer 7 to 10 minutes or until tender. Drain. 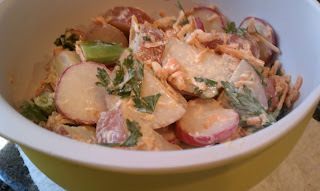 Place potatoes in a large bowl; sprinkle with vinegar and oil, and toss gently. Cool completely (about 1 hour). 2. Whisk together buttermilk and next 3 ingredients. Stir in carrots and next 6 ingredients; season with salt and pepper to taste. Spoon buttermilk mixture over potato mixture; toss gently to coat. Cover and chill 1 to 24 hours before serving. Cost $14.50 for entire ingredients. See original Southern Living posting here. Click me to see original recipe posting. 1. Preheat the oven to 425° and position a rack in the lower third of the oven. In a large shallow bowl, whisk the flour, baking powder, baking soda, sugar and fine salt. Add the chilled butter and use a pastry blender or 2 knives to cut the butter into the flour until it is the size of peas. 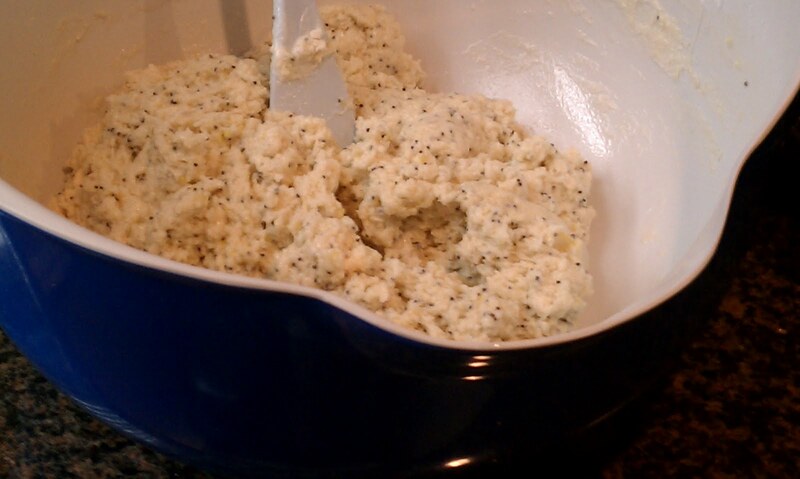 Add the grated zest and the poppy seeds. Stir in the buttermilk just until the dough is moistened. Lightly dust a work surface with flour. Turn the dough out onto the surface and knead 2 or 3 times, just until it comes together. Pat the dough into a 1/2-inch-thick disk. 2. Using a floured 2 1/4-inch round cookie cutter, stamp out biscuit rounds as closely together as possible. Gather the scraps and knead them together 2 or 3 times, then flatten the dough and stamp out more biscuit rounds. Pat the remaining scraps together and gently press them into a biscuit. 3. Transfer the biscuits to a large baking sheet and brush the tops with the melted butter. 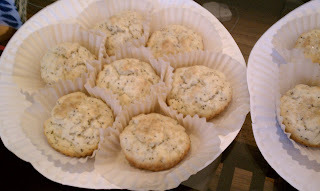 Lightly sprinkle the biscuits with a few grains of flaky salt and chill until firm, about 10 minutes. 4. Bake the biscuits for 20 minutes, or until golden. Let the biscuits cool slightly on the baking sheet before serving. MAKE AHEAD The unbaked biscuits can be frozen: Freeze biscuits in a single layer and transfer to a resealable plastic bag for up to one month. Bake straight from the freezer, adding a few minutes to the cooking time. 1. In a large bowl, whisk the lime zest and lime juice with the rice vinegar, brown sugar and soy sauce. Whisk in the 1/4 cup of vegetable oil and season with salt and pepper. 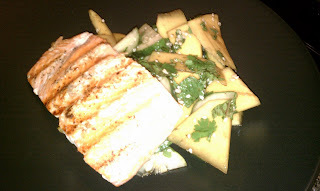 Add the sliced green mango, cucumber, cilantro, mint and 1 tablespoon of the roasted sesame seeds. 2. Light a grill or preheat a grill pan. Brush the salmon fillets with vegetable oil and season them with salt and pepper. Grill the salmon skin side down over moderate heat, turning once, until the skin is very crisp and the fish is slightly opaque in the center, 10 to 12 minutes. Transfer the salmon fillets to plates, sprinkle them with the remaining 1 tablespoon of roasted sesame seeds and serve with the mango salad. The green mango salad can be covered with plastic wrap and refrigerated for up to 4 hours. Add the chopped cilantro and mint just before serving. 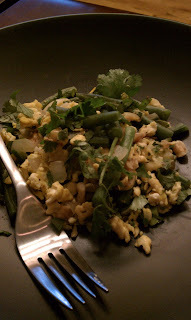 This Georgian dish, called lobio (bean dish), is typically served cool, but with its buttery scrambled eggs and tender green beans, it's equally delicious hot. It's great as part of a family-style menu and also makes an unusually tasty, light main course. 1/2 teaspoon dill seeds I used Thyme leaves since no dill seeds were available. In a large saucepan of boiling salted water, cook the green beans until tender, 6 minutes. Drain and let cool. Transfer to a bowl. In a large nonstick skillet, melt the butter in the oil. Add the onion and cook over moderate heat, stirring, until softened, about 6 minutes. Add the eggs and season with salt and pepper. Cook over moderate heat, stirring, until the eggs are scrambled, about 3 minutes. Add the eggs to the beans. Stir in the chopped cilantro, walnuts, garlic, jalapeño, red chile and dill seeds. Season with salt and pepper. Garnish with cilantro sprigs just before serving. MAKE AHEAD The green lobio can be refrigerated for up to 4 hours.